Now the Nokia OVI store offered a lots of free applications for the Nokia Mobiles which can be download free of cost from the Nokia OVI store. The Nokia Facebook Chat is one of the free applications which is provided by mSonar Limited and can be download from Nokia OVI free of cost. Now a days, most of the users are want to chat online with their friends by using their mobile device but sometimes chatting feature in the mobile device become very tough for technical reasons. But now onward users wouldn't get any trouble to chatting online with their facebook friends because through the application Facebook Chat it will be very easy to chat online with their friends. Just need to download the application from the Nokia OVI store and after installed it one can enjoy the facebook chatting facility in the Nokia device. Users need not to pay anything for downloading the same from the Nokia OVI store. 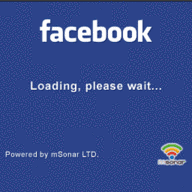 The Facebook Chat application is provided by the Mail-Bit LTD and the file size of the same is only 0.27MB. So, users need not large space for avail the feature in the mobile. With the apps users now directly chat with facebook contacts without open the homepage of Facebook. So, go for it and enjoy the facebook chatting in Nokia mobile device. One can also Download applications for Nokia for enjoying the various free applications provided by Nokia OVI. One can also Set the Nokia Device for avail the facebook chat facility in the Nokia Mobile Phone.